43, rue des Petites Ecuries, in the 10th Arrondissement. 01 42 46 43 55. Mon–Fri, lunch and dinner. After leaving Racines nearly two years ago, Pierre Jancou is back with a beautiful new address. 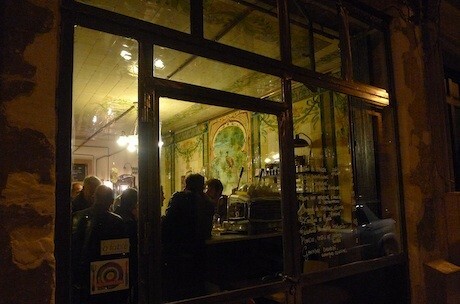 One of the most talked-about Paris bistros this season, Vivant is housed in a former bird shop, decorated with exquisite tile work, painted with peacocks perched among leafy garlands in a million shades of green and yellow. Jancou has a knack for locations, for unearthing buried gems, brushing off the layers of dirt and letting them shine. One could say he does the same thing with food and wine. He finds the best products, from passionate farmers, vignerons and artisans who share his commitment to nature and quality (inseparable in his mind, I think), and serves them up with a near-militant passion and ardent simplicity. Many of the products are French, but there’s plenty of Italian terroir covered at Vivant, too. The menu changes regularly. We started with ruffles of Parma ham (sliced on a gleaming Berkel, of course), great with the last sips of the aromatic white from Pantelleria that was poured as an apéro. A slab of superb Dupérier foie gras followed, served over a salad of shaved artichokes and delicate greens. The wines are quirky, sometimes wild, and unmistakably natural. An effervescent white from Emilia-Romagna pleased, but a rosé had too much residual sugar for me. We switched to a light red. An asparagus risotto was topped with black truffle, the green tips and the rice appropriately al dente. Line-caught marlin was served on an ample bed of bright green spinach. 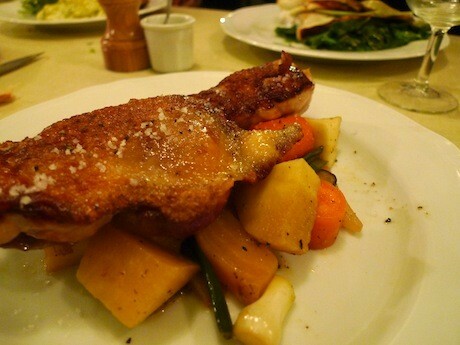 I had the signature poularde racines, a deboned chicken, well seasoned, skin cooked to pure gold on a griddle and accompanied by sweet and earthy root vegetables. Simple, yes, but delicious, each thing tasting intensely like itself. The chocolate ganache was tempting but we skipped dessert in favor of a plate of pecorino and Taleggio, the latter a rare find in Paris. You can also count on a perfectly pulled espresso. Now the caveats: it’s true that a meal at Vivant is more expensive than at other Paris bistros, but premium ingredients demand premium prices. If you don’t care that your asparagus was organically grown by Annie Bertin, or can’t imagine spending 25 euros on a chicken no matter how well it was raised, then Vivant is probably not for you. In general, signing up for a meal at Vivant requires giving yourself over to Jancou’s vision, doing things his way for a couple of hours. If you’re not willing to do that, don’t book a table here. In a nutshell: Pierre Jancou’s trademark passion for all things natural and organic, and the people who produce them, is once again on full display at this gorgeous bistro. Price check: First courses, 10–24 euros; mains, 24–26 euros; desserts and cheese, 8–12 euros. If Vivant sounds good, you might also like Saturne, run by former Jancou collaborators. Read the review. 7, rue Notre Dame des Victoires, in the 2nd. 01 42 60 31 90. Mon–Fri, lunch and dinner.